Fong Ho Machinery was established in 1979. Fong Ho Sawing machines can meet a wide range of customer’s requirements and cut many different materials such as copper, aluminum, steel, stainless steel and special shapes. They are available in manual, semi-automatic, fully-automatic and CNC configurations and all of our machines deliver high speed, low noise safe cutting for your workshop. Fong Ho has longstanding partnerships around the world and is a company you can count on and cooperate with. Because of our outstanding quality and complete after sales service we have achieved good sales volume in Middle-east, Japan, Australia, Southeast Asia, India, North America, South America, Middle America and The European Union. In addition Fong Ho has also established service stations around the world in Korea, Thailand, Malaysia, Indonesia, Vietnam, Hong Kong, Japan, USA, France, Dongguan, Amoy, Kunshan, Shanghai, Ningbo, Beijing, Tianjin in China. 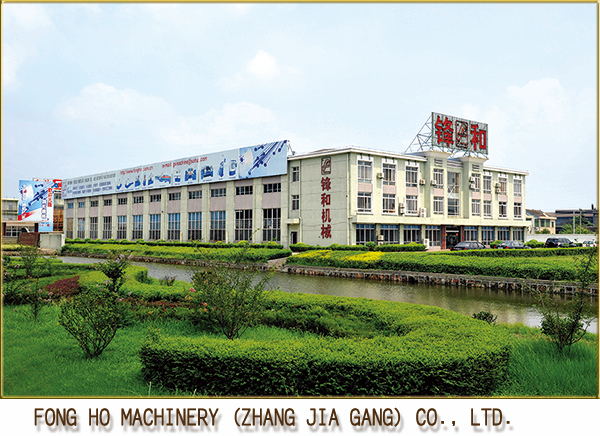 Taiwan Fong Ho Machinery Industry capitalized China Fong Ho Machinery (Zhang Jia Gang) Ltd. Exclusively and in Sep. 1998 China Fong Ho Machinery (Zhang Jia Gang) Ltd. Was formally established as a sole proprietorship at Zhang Jia Gang Jiangsu Province in China. China Fong Ho Machinery integrates and builds on the experience of Fong Ho continuously and follows the company’s spirit of continuous improvement to providing the highest quality and most user-friendly machines for customers. Now, Fong Ho machinery’s production range has expanded to include HSS circular cold saw, pipe chamfering machines, HSS saw blade sharpener, HSS CNC saw blade sharpener, CNC carbide sawing machines, CNC tungsten carbide sawing machine and special purpose pipe reworking machines and many others. FONG HO MACHINERY (ZHANG JIA GANG) CO., LTD.